Oh me. Waiting for my love to join me in a romantic gondola ride. Tee Hee! 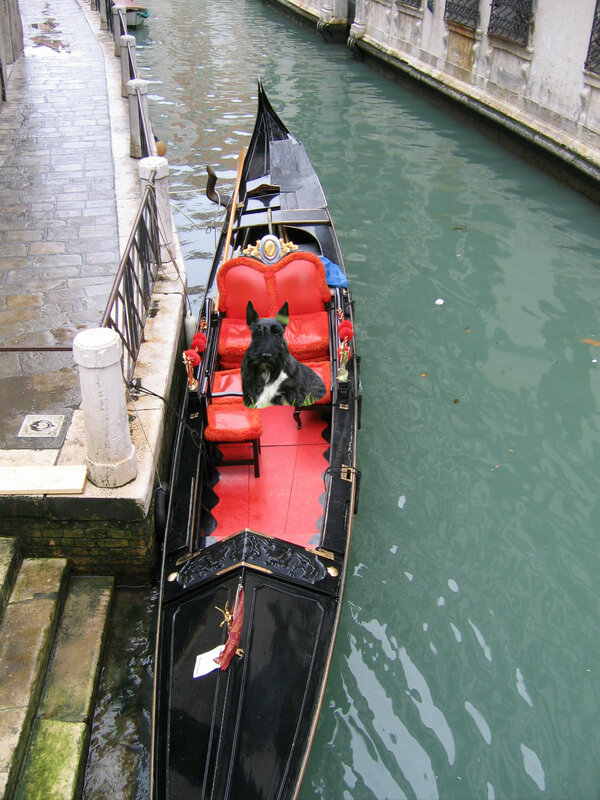 This entry was posted in The Scottie Chronicles and tagged dogs, funny pet photos, gondolas, love, Scotties, Venice. Bookmark the permalink. I have this Where in the World nailed. What’s that? It’s tomorrow. Drats. Where’s your life vest? You know we sink like stones. Yes, Stuart! Where is your life vest? You’re making us very nervous without one! Venice is wonderful! You’d make a cute gondolier! So…did your bring that bone to share with your love…bet she would like to munch on it! Our intertoobs are being dumb. None of the pics on your blog will load for us… But our nets have been iffy since they launched Netflix here in Aus. yes! we had to go through the site. we could not get to this through the email. Probably those darned sun spots.